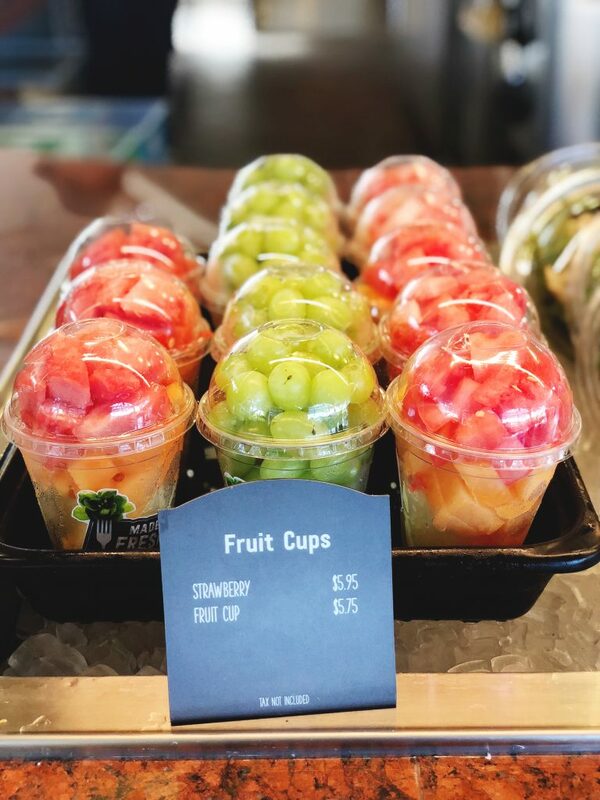 When I was nine months pregnant with my first October baby, six years ago, a friend told me about a local coffee shop that had amazing vegan pumpkin muffins. 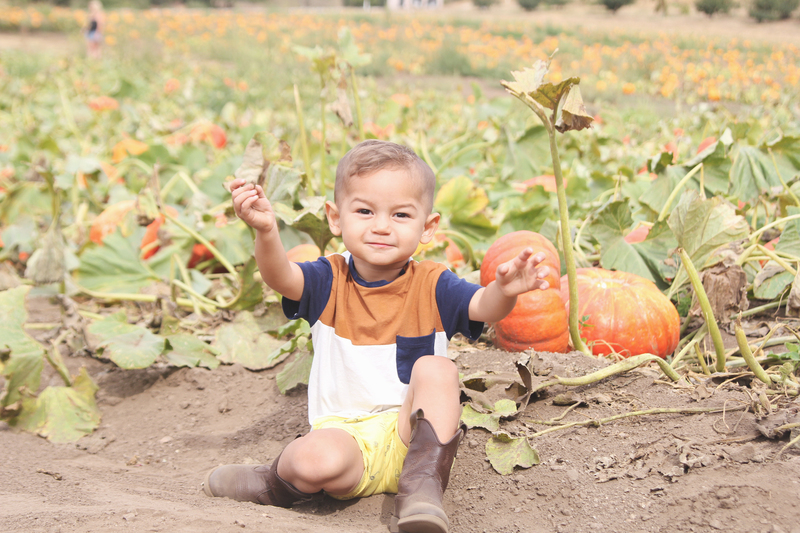 We excitedly drove there after dinner that night, with my pregnant mind on all things pumpkin. By the time we arrived, they had completely sold out and I was so bummed. Right then and there in the parking lot, we scoured the internet for the best vegan pumpkin muffins, ran to the store and grabbed the ingredients and hoped that I wouldn’t go into labor before I could get a taste. Luckily, we hit the jackpot on our first try. These really are THE VERY BEST pumpkin muffins. They are a total crowd pleaser, fall or not. 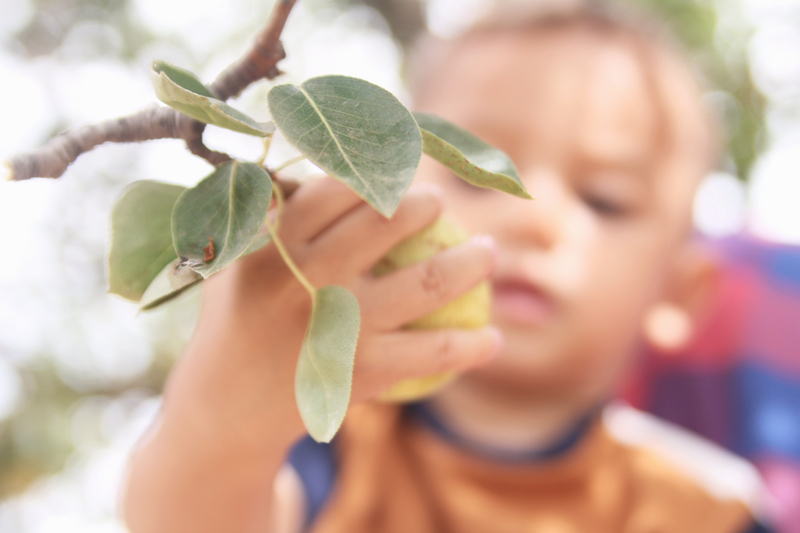 We always love eating them at our annual fall picnic with coconut caramel and sliced apples. I know a lot of people have had success with adding nuts, but I always add chocolate chips and a little bit of vanilla. But they are honestly the perfect fall spice blend, no additions necessary. October is here! 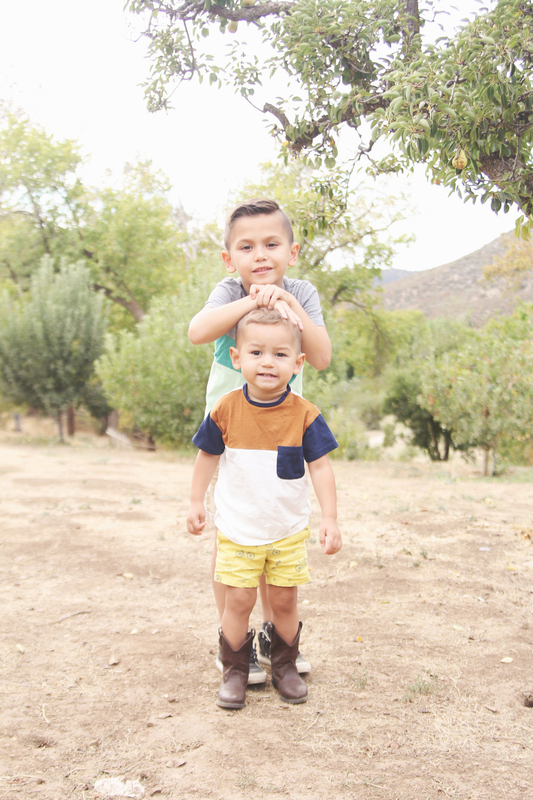 We are so excited, not only for all of the fun fall activities, but it also means birthday month for our boys. 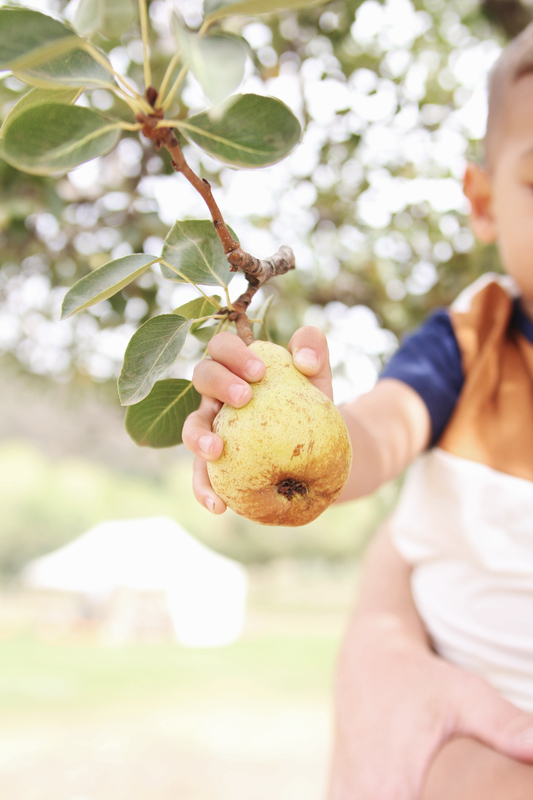 To welcome one of our very favorite months, we went on our annual pear picking adventure. 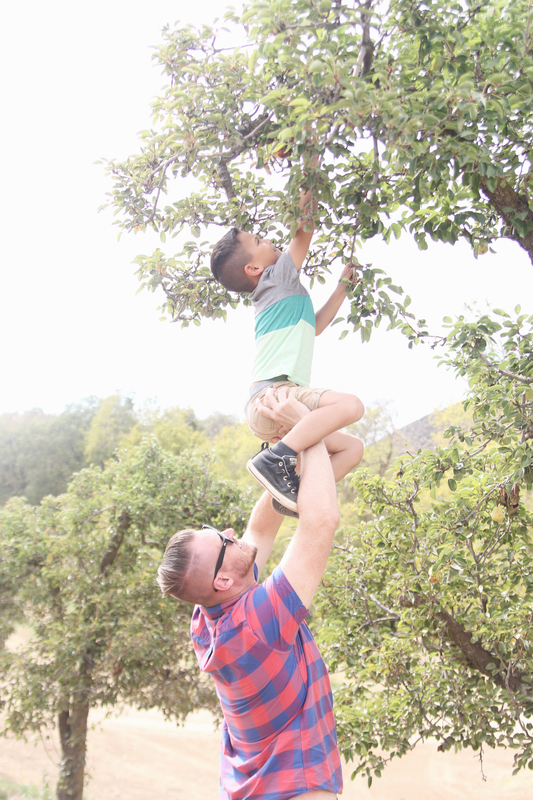 It definitely pays to have a tall dad when trying to get the best fruits at the top. Now we need to figure out what to do with all of our pickings. I’m so glad we live in a world where there are Octobers…. I’m so glad I live in a world where there are Octobers…. 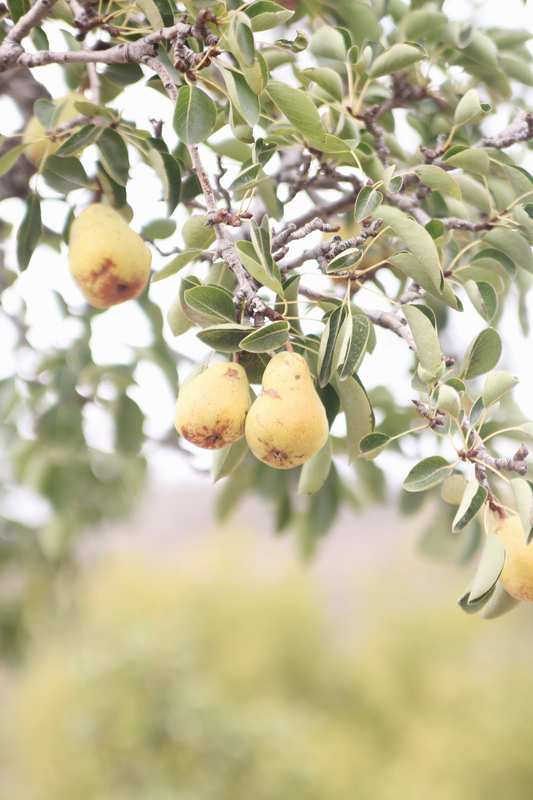 Our top five favorite vegan things of autumn! Fall is such an exciting time. Cool crisp mornings, a slight breeze in the air. 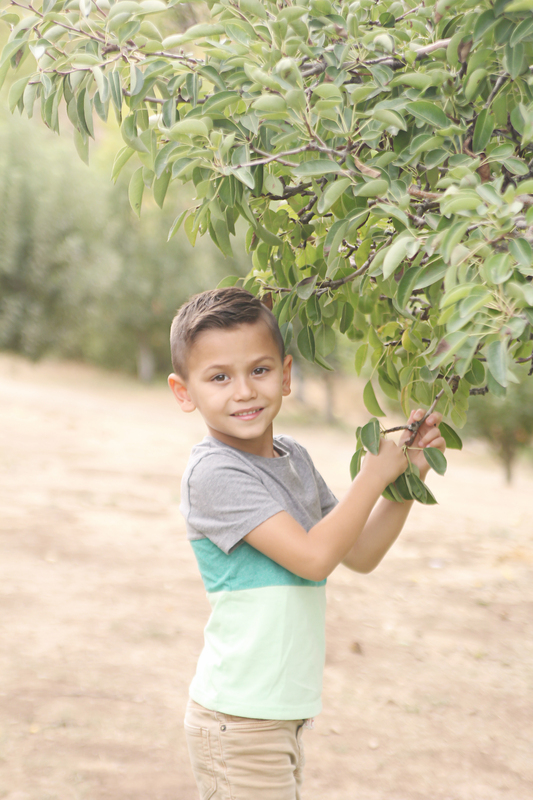 Apple picking and pumpkin patches. 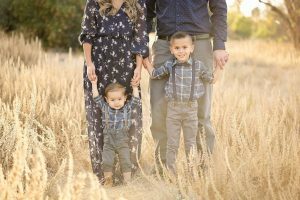 And aside from all of the pumpkin spice goodness, it also marks the beginning of birthday season around here, so it’s arrival is doubly exciting for our family. 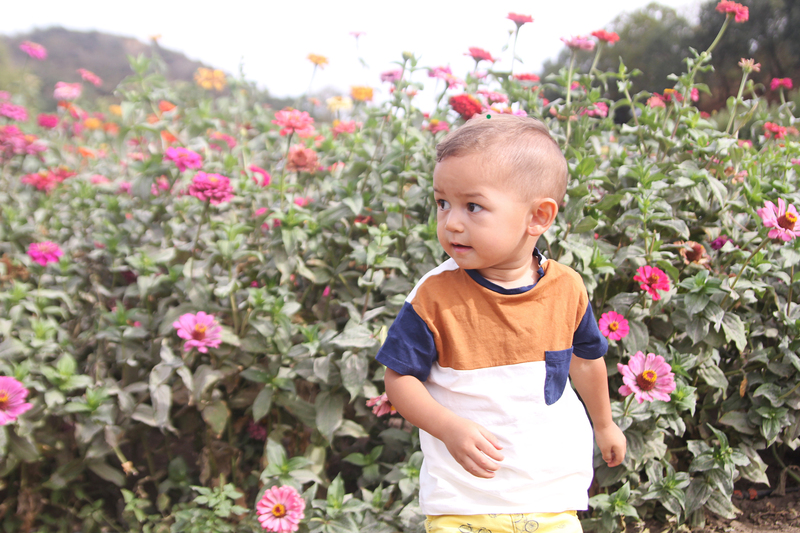 Needless to say, we love everything autumn! 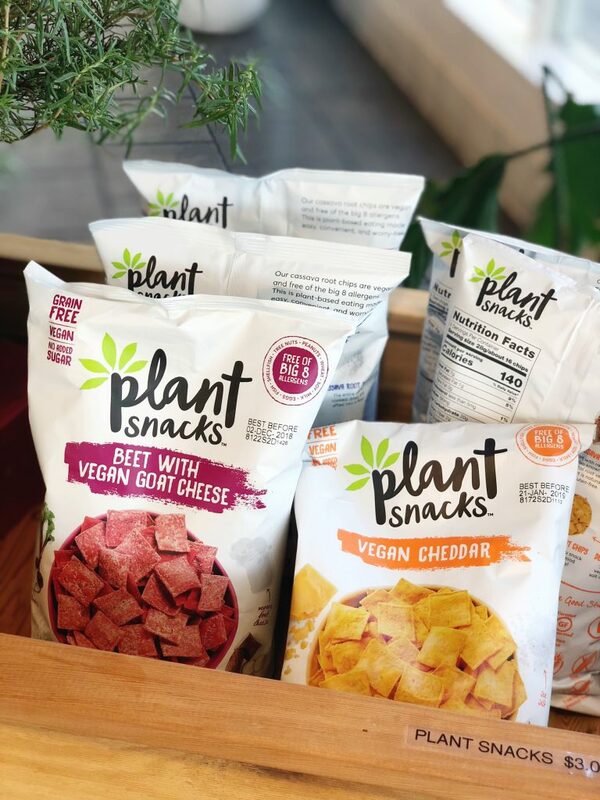 We are so excited about new and old favorites and wanted to share our top five favorite vegan fall finds from this season! 1. Unintentionally vegan “Pumpkin Rolls” from Trader Joe’s. 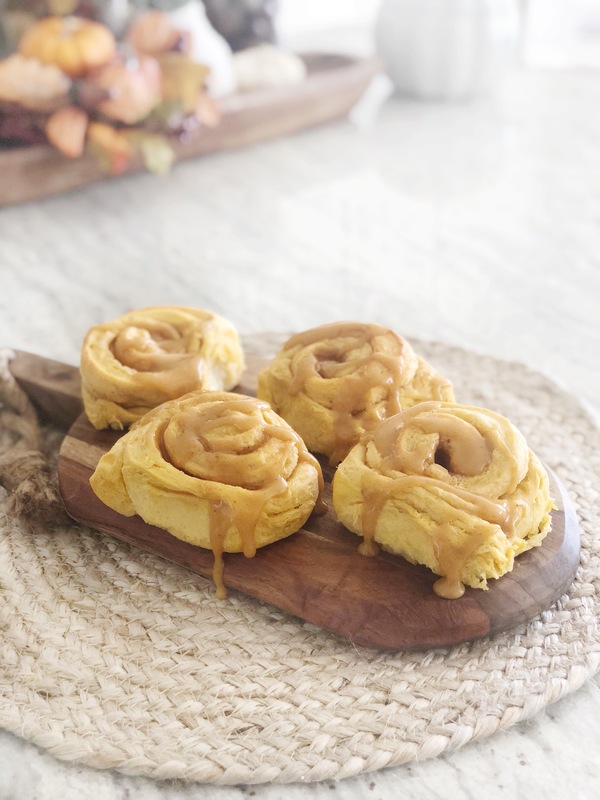 These delicious cinnamon rolls come with a packet of pumpkin spice icing, which makes for a perfectly festive fall breakfast. Or dessert. Or any meal for that matter. Trader Joe’s regular cinnamon rolls are also accidentally vegan. Another way to enjoy these are by sticking them in a waffle maker and eating them like waffles. Either way, you can’t go wrong with this fresh-out-of-the-oven goodness. 2. Toffee Nut Almond Milk Steamer from Starbucks. 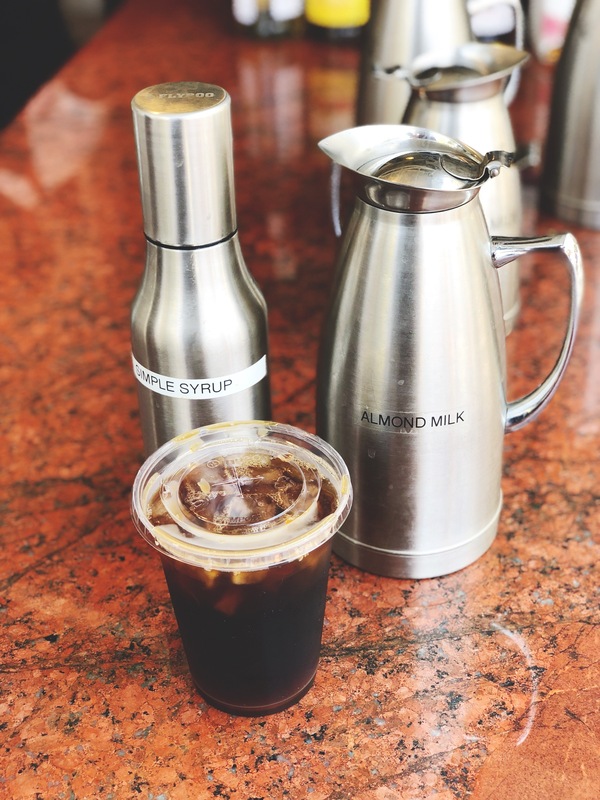 There are plenty of fall favorite coffee drinks out there, many of which can be veganized. But for a kid-friendly and caffeine free treat, we love these steamers. 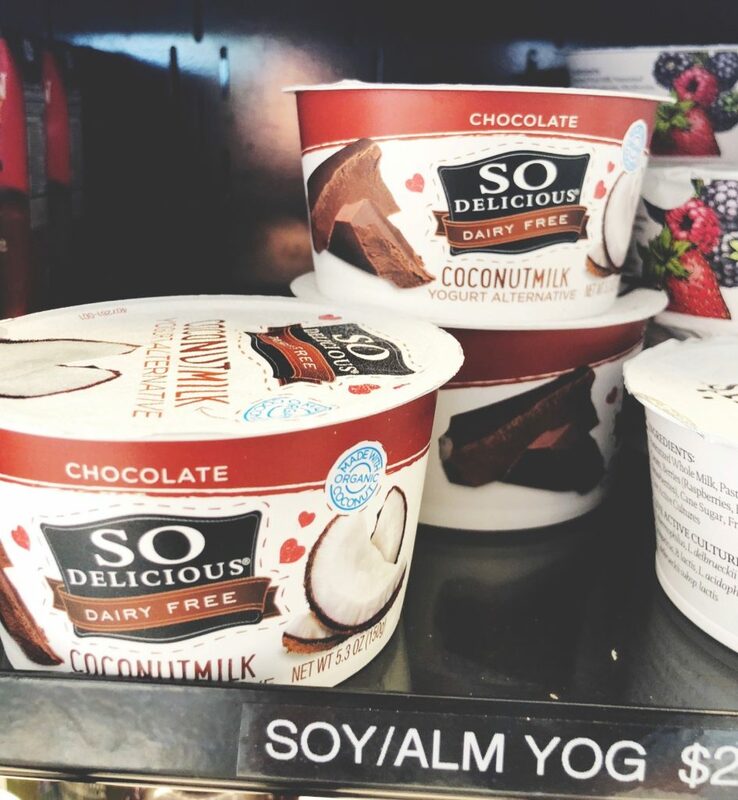 They are basically a steamed almond milk, with any added flavor of your choice. 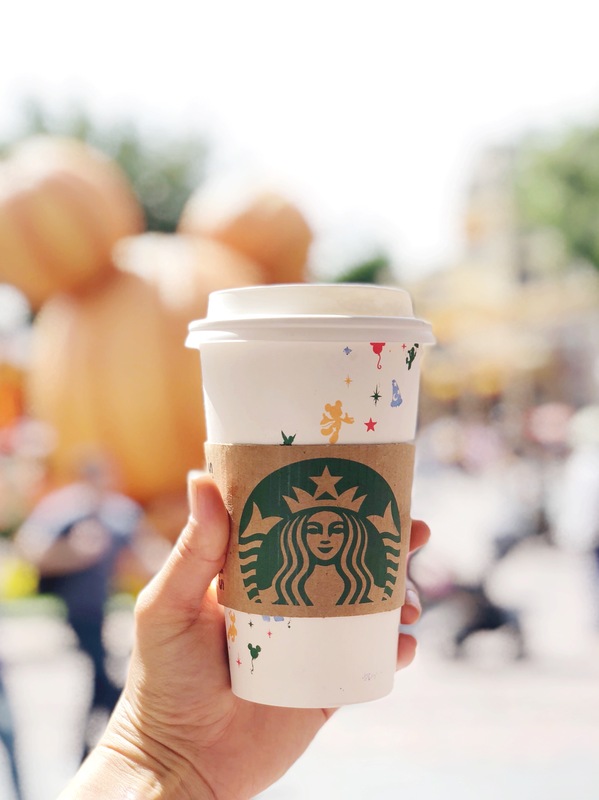 Toffee Nut gives you that perfect fall taste. 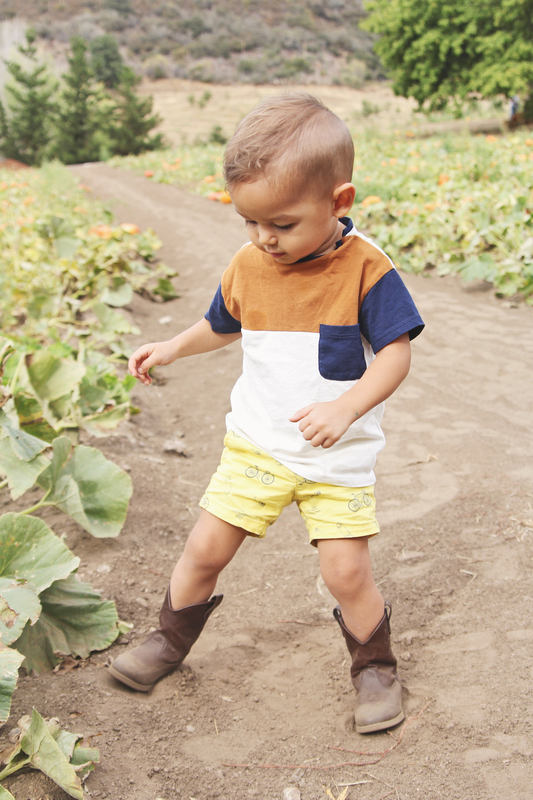 You can get these year round, but they are especially fun to order in the fall while walking around the pumpkin patch. For an extra autumn feel, add Starbucks “Autumn Sugar Topping” and it will put you in the mood for all things fall. 3. 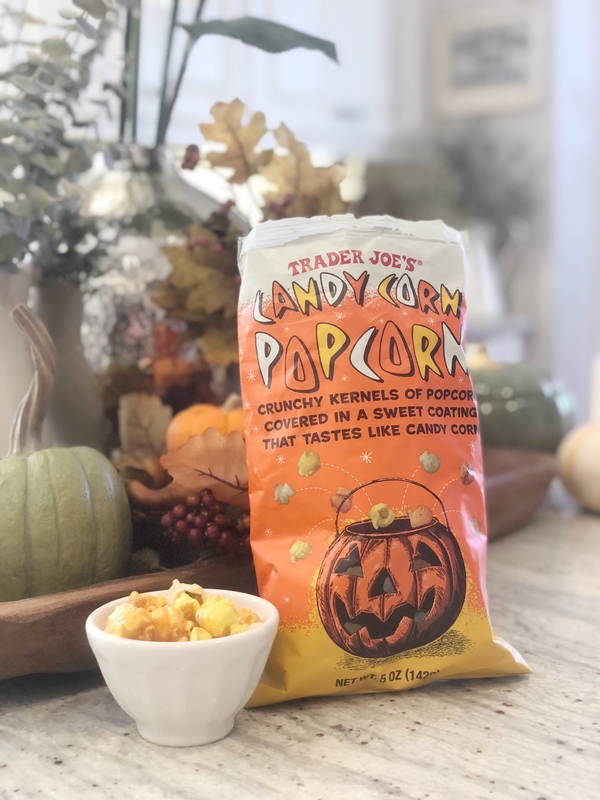 Trader Joes Candy Corn Popcorn. Dare I say that these actually taste BETTER than candy corn? 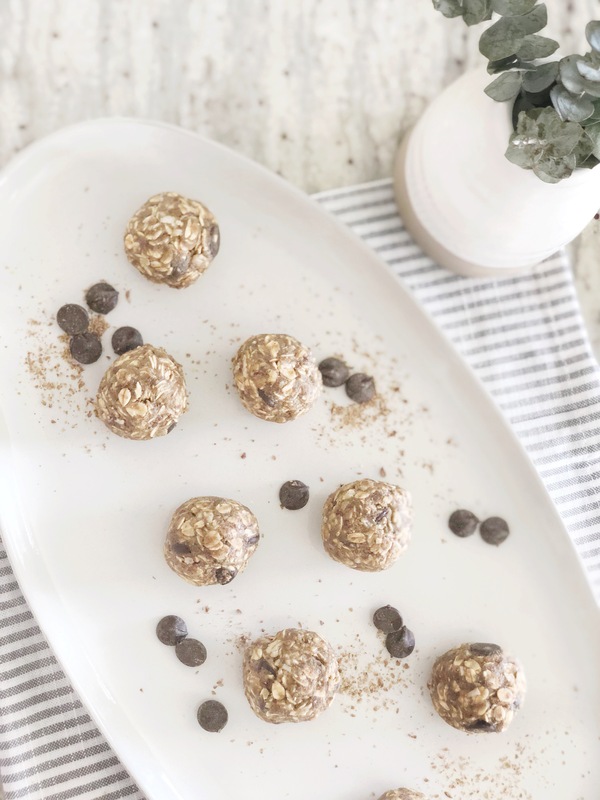 If you have a sweet tooth, you will definitely love these. 4. 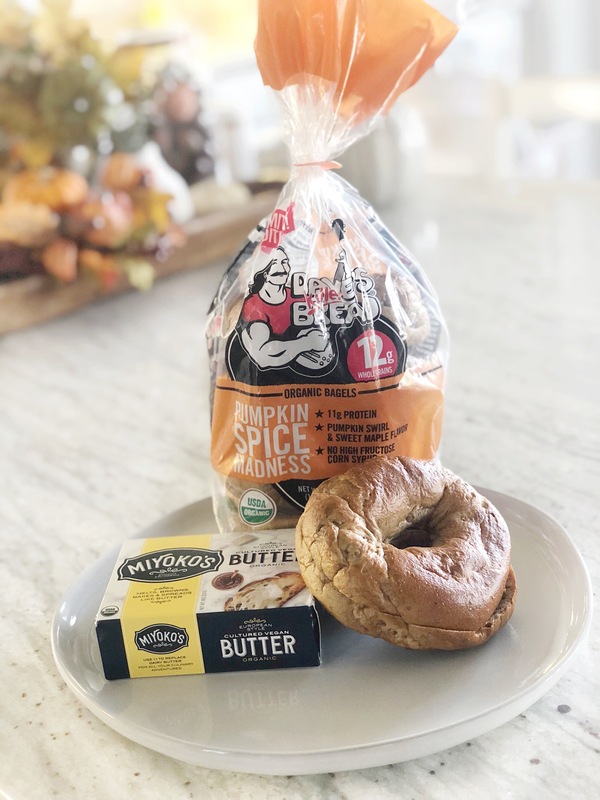 Dave’s Killer Bread Pumpkin Spice Madness Bagels. 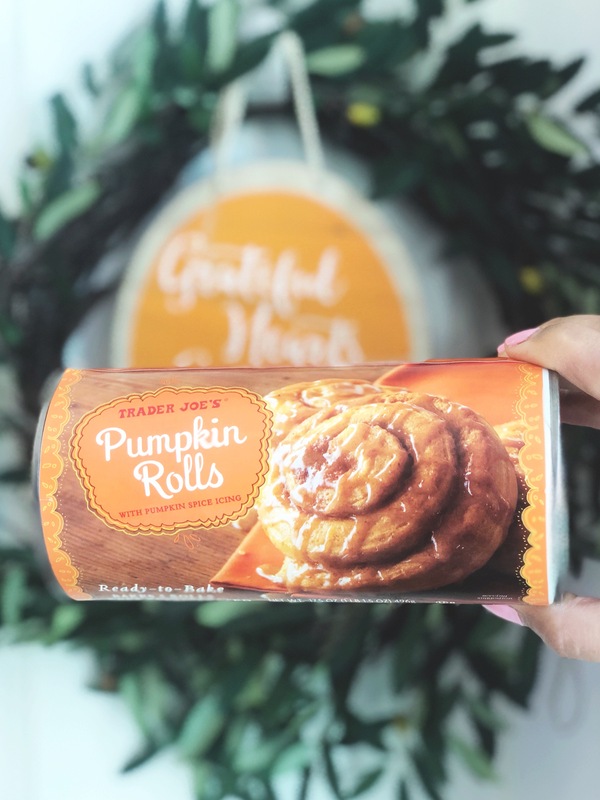 If you love pumpkin, these are exactly what you need in your life. 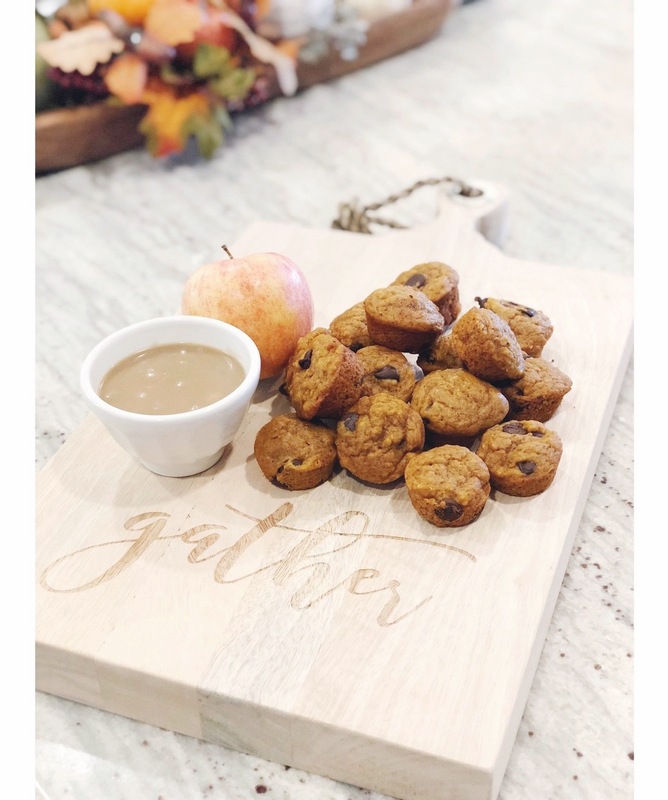 They are absolutely the perfect fall food and I love the idea behind the company. 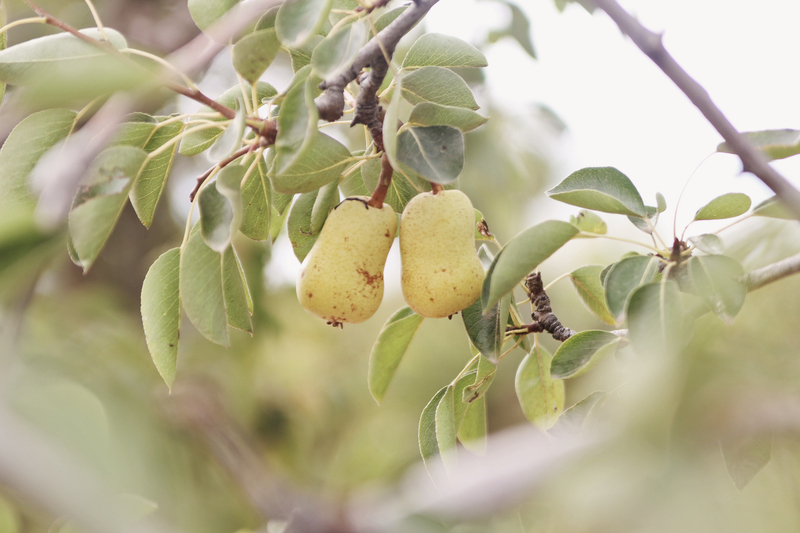 Pair them with Miyoko’s Butter for a delicious, mouthwatering combination. 5. 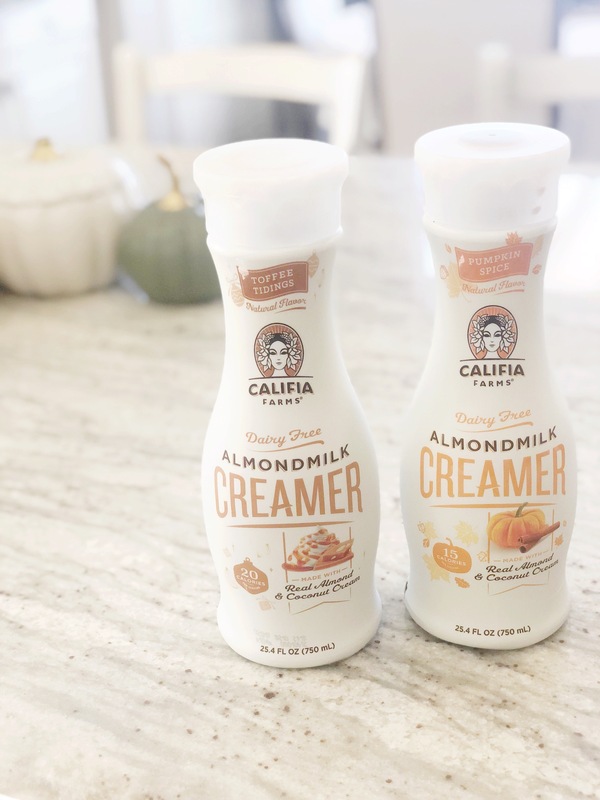 Califia Farms Almondmilk Creamer. In delicious fall flavors like Pumpkin Spice and Toffee Tidings, your fall morning brew will put you in the perfect autumn mood. A Bite of the Future & GIVEAWAY! 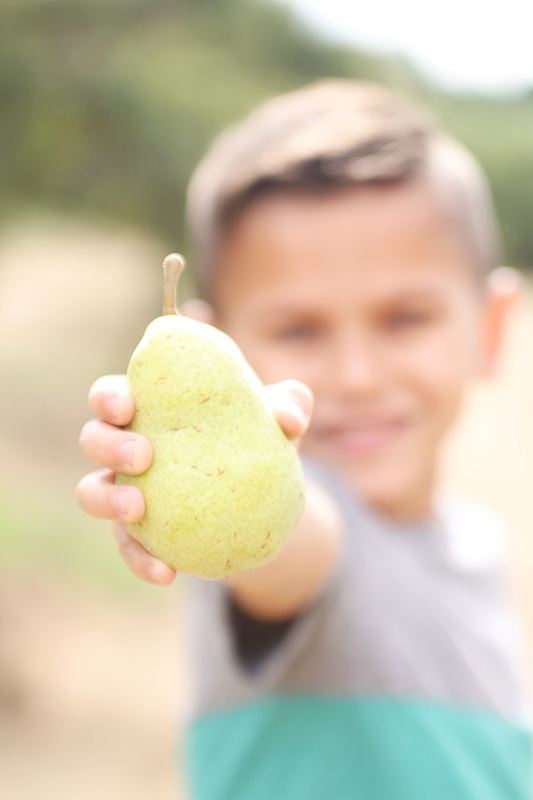 Starting this blog has afforded me a handful of very cool opportunities, which I love sharing. But one that I am most excited about is a partnership with a brand that I love, No Cow. 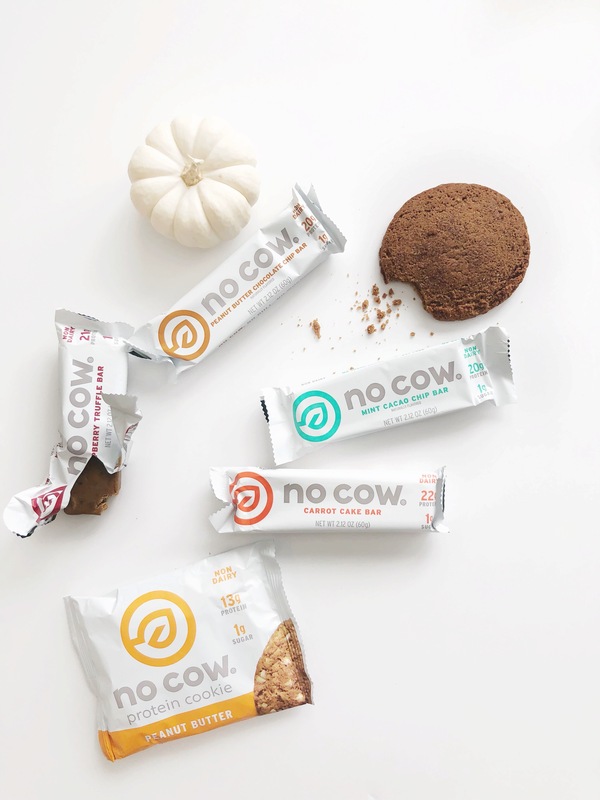 No Cow is a company that believes in delivering high-quality, non-dairy protein with ridiculously low sugar. 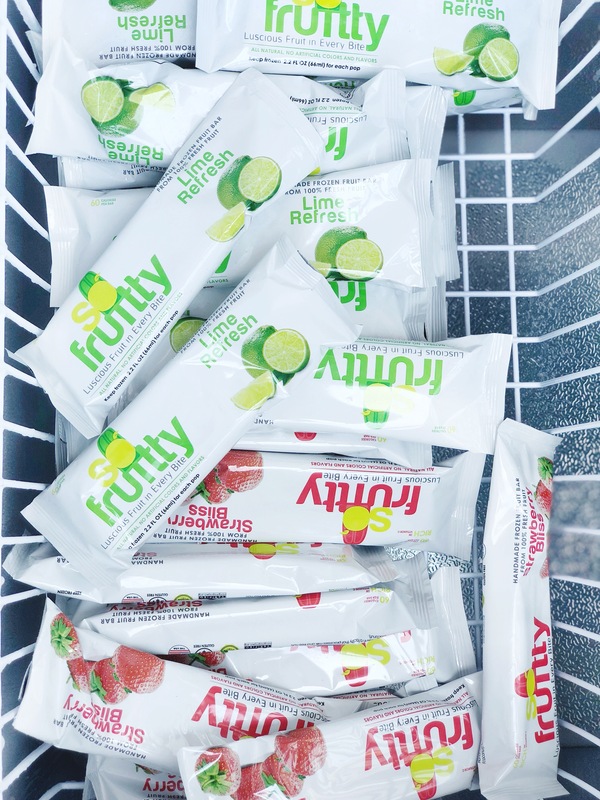 There are so many other protein bars and cookies out there, masking themselves as a health food, but are loaded with sugar and other awful ingredients. 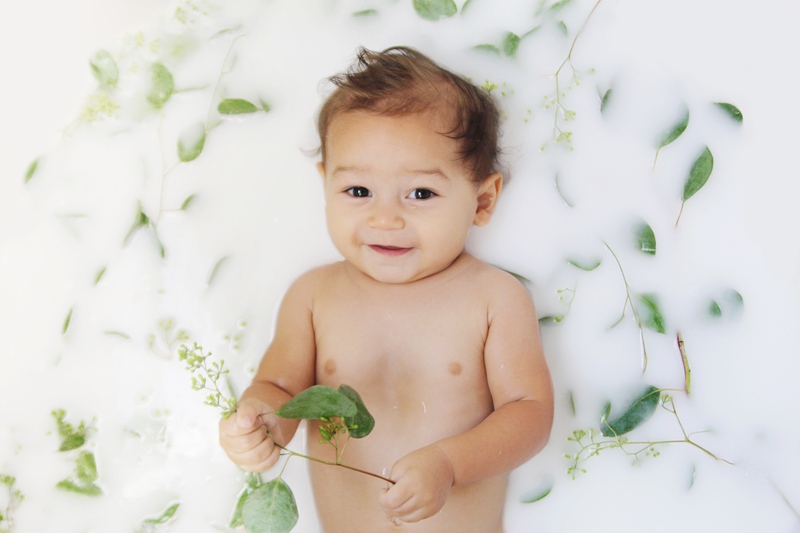 No Cow is a genuine company that cares what goes into your body, without including dairy, gluten, soy or GMO’s. 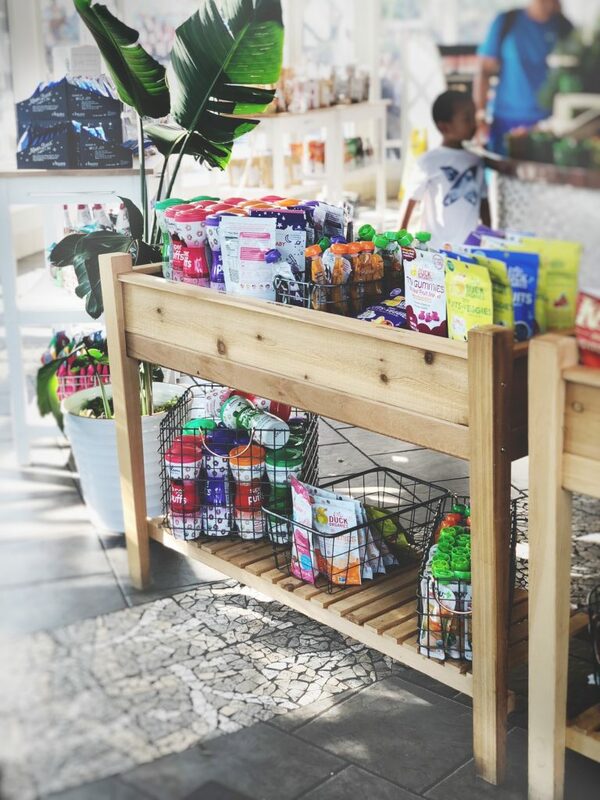 And the flavors are delicious…lemon meringue, mint cacao chip, blueberry cobbler bars and snickerdoodle and double chocolate protein cookies! And all with less than 1g of sugar! 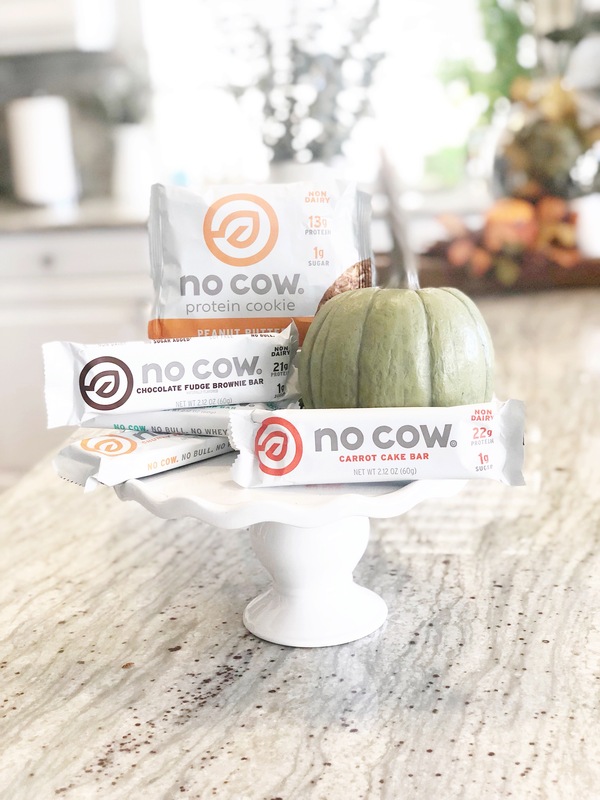 I am so excited to be giving away a variety pack of No Cow protein bars and cookies! Check out my post on instagram to enter (it’s super easy! ): @plantbasedmomma. AND we are also excited to offer 20% off of your first No Cow order! Just check out their website and enter the code “joannah20” at checkout. 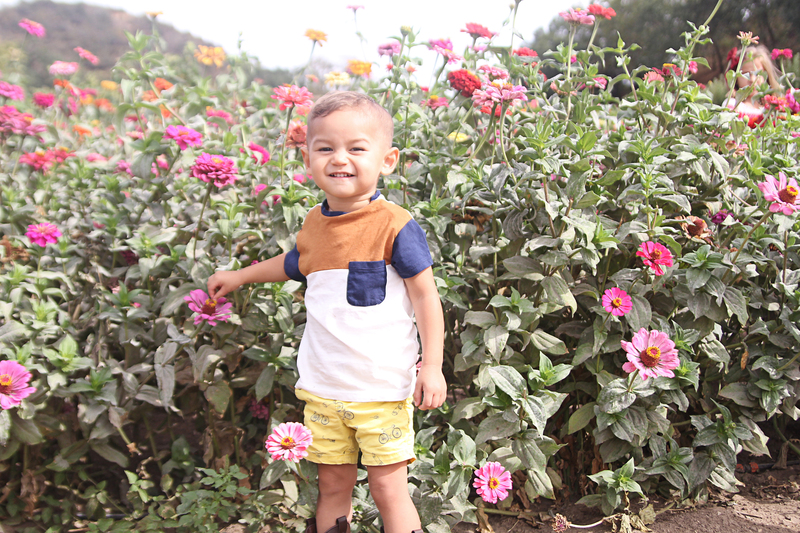 Hope you love them as much as we do! Giveaway ends Sunday September 23, 2018 at 5pm PST. *Keep in mind that we may receive affiliate commissions when you click our links and make purchases. However, this does not impact our honest reviews and opinions. 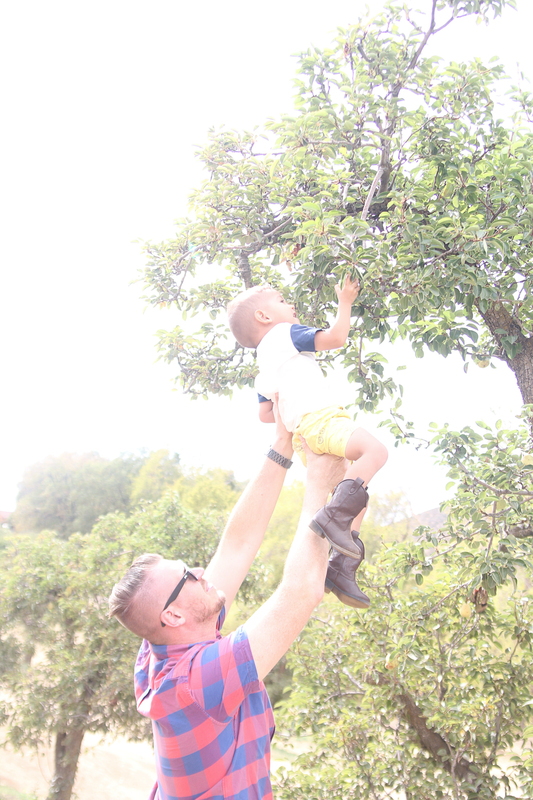 We try our best to share things that we genuinely love and hope that you do too! 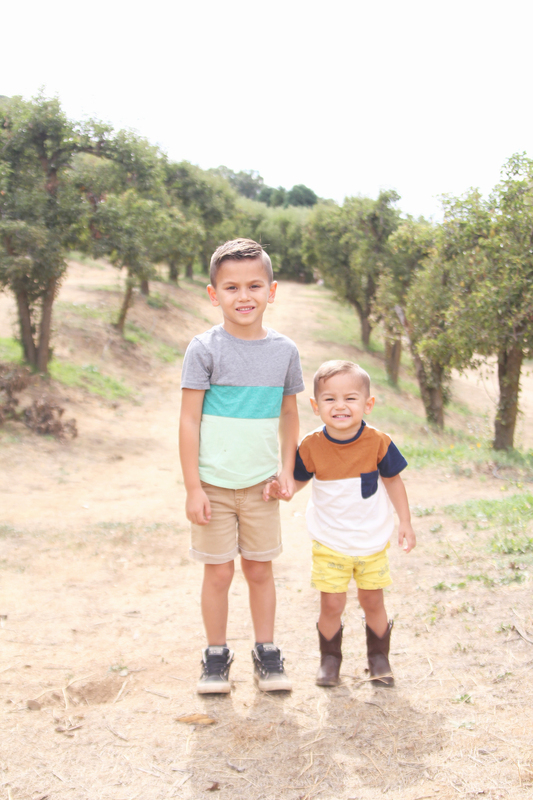 We recently bought Legoland San Diego passes, thanks to Costco for having an amazing one-day deal. 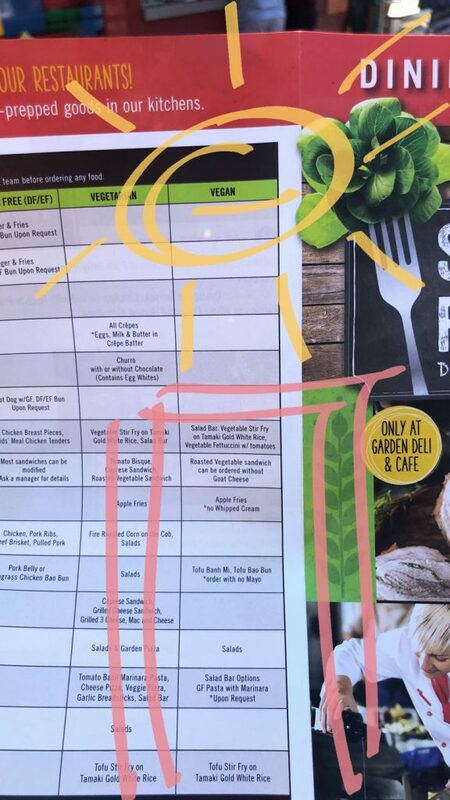 Did you know that Legoland is very vegan friendly!? Well, we didn’t. After visiting a few times, we realized that Legoland is highly underrated, for both food and fun. Our family is pretty loyal to Disneyland, but our boys are obsessed with legos and after finding that great deal on passes, we couldn’t resist. 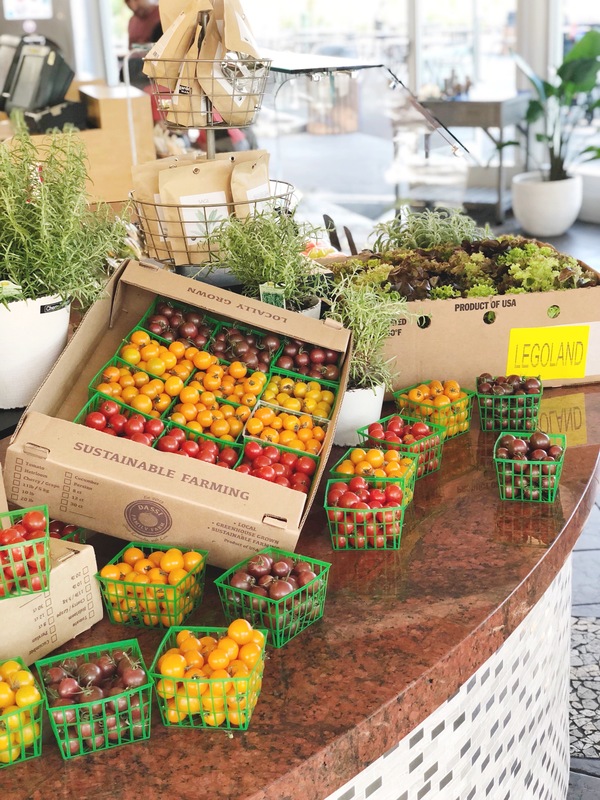 Although there aren’t a plethora of vegan options, what they do have to offer is incredibly substantial and did not disappoint. 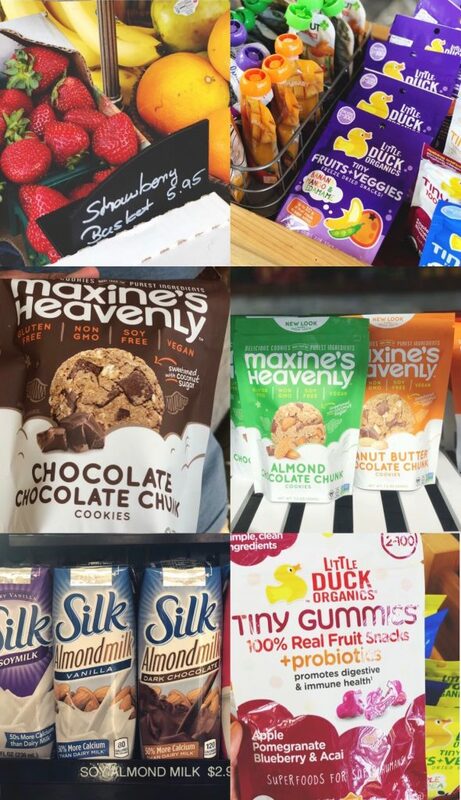 I was especially impressed with all of the vegan snack options they offered! 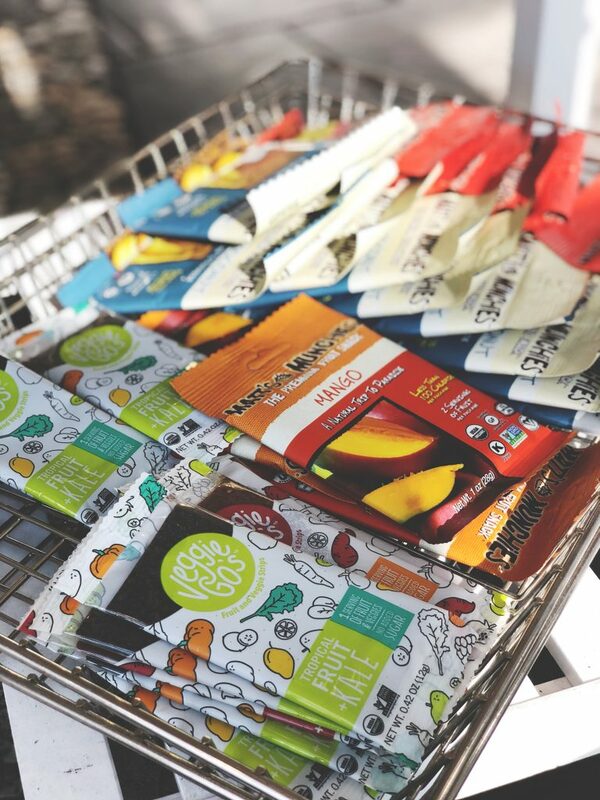 They had specialties like our favorite vegan beef jerky at a cheaper price than I usually get through Amazon. 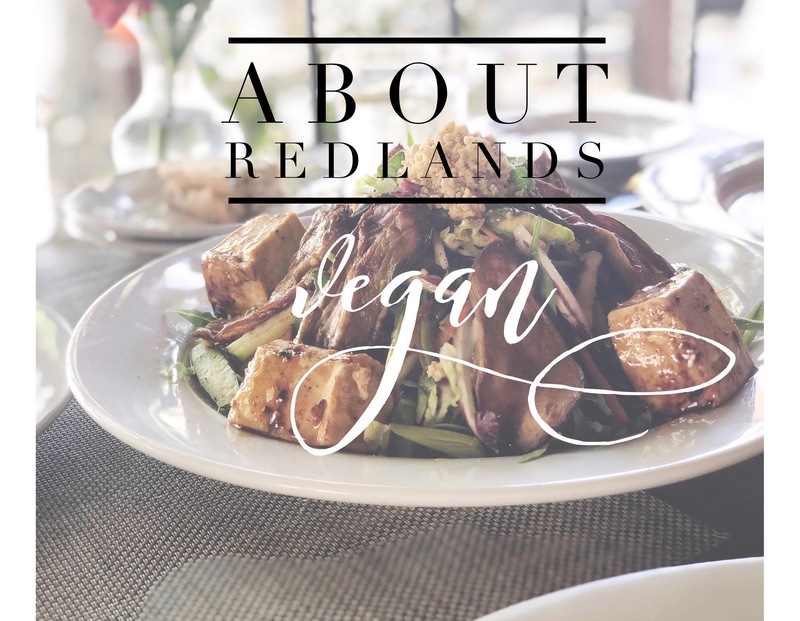 There isn’t a lot of information on the Internet for vegans at Legoland, so I wanted to share everything that we tried and loved! 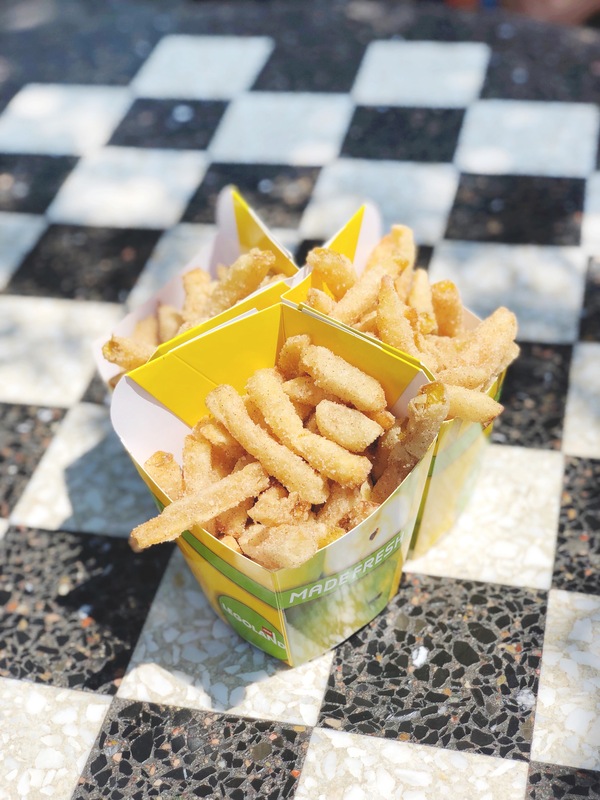 Apple fries from Granny’s Apple Fries – these were a total hit with our family. They are covered in cinnamon sugar and a delicious treat. Be sure to ask for them without whipped cream. 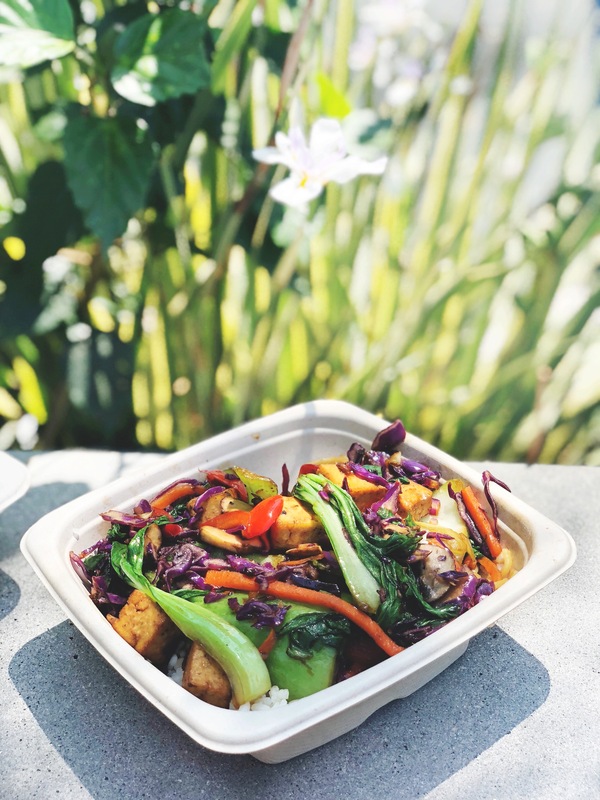 Tofu Stir Fry from Wok ‘N’ Bowl Ramen – these were hearty and packed with a delicious flavor. This dish totally deviates from the stigma of bland amusement park food. While the allergen menu does not list any noodles, they do have one vegan noodle option. The kids loved it and ate it all, so it’s a huge win in my book. 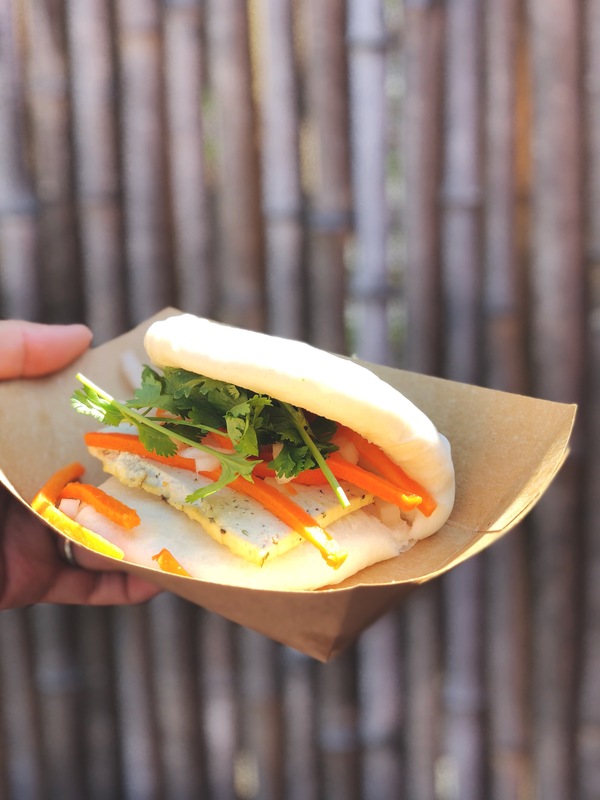 Tofu Bao Bun from Ninja Kitchen – This was delicious and fresh and the husband and I enjoyed it very much. The tofu is pre-marinated in spices, so if you have a child with aversions to anything spicy, you may want to skip this one. The bun was tasty and fluffy and it paired well with the crisp pickled veggies. It all made for a delicious combination, just don’t forget to forgo the mayo. 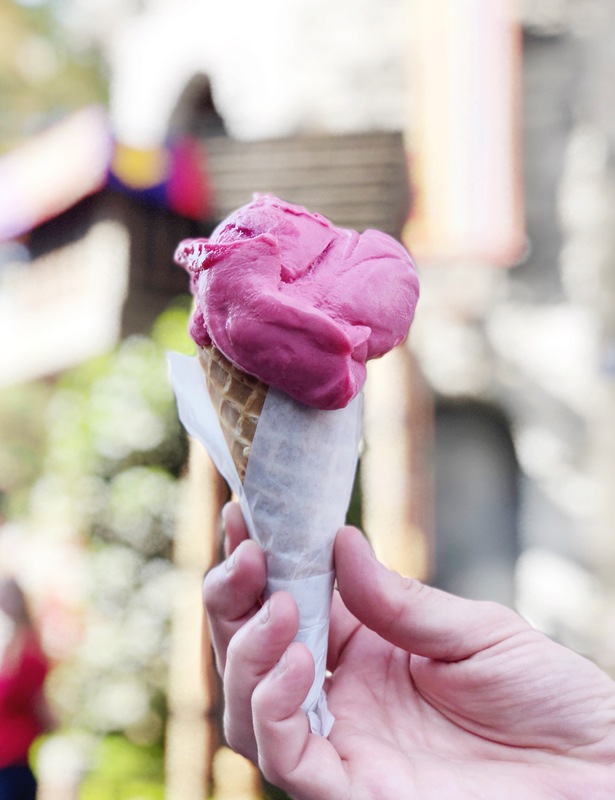 Castle Ice Cream – Raspberry Sorbet. While we only had one option of scooped ice cream (which we were grateful for! 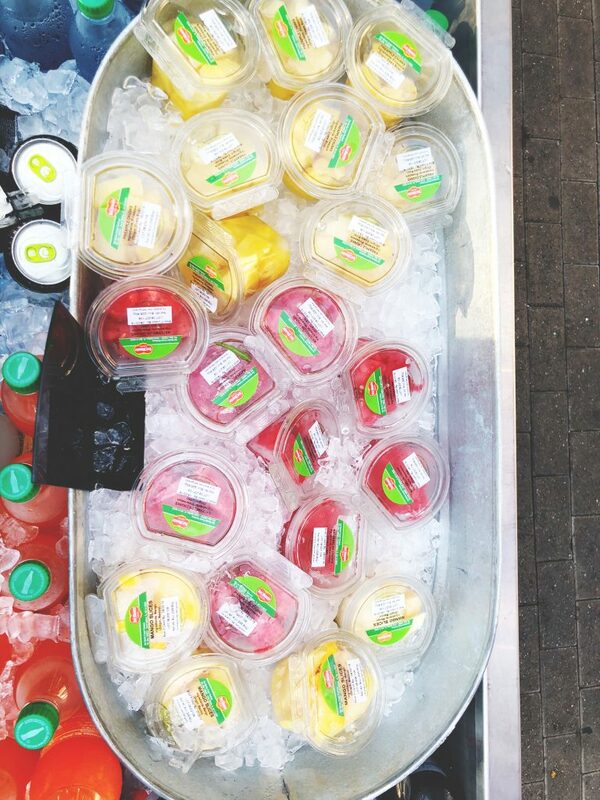 ), we did have a few different popsicle flavors to choose from (From The Coffee Shop). With both options, the kids were happy. 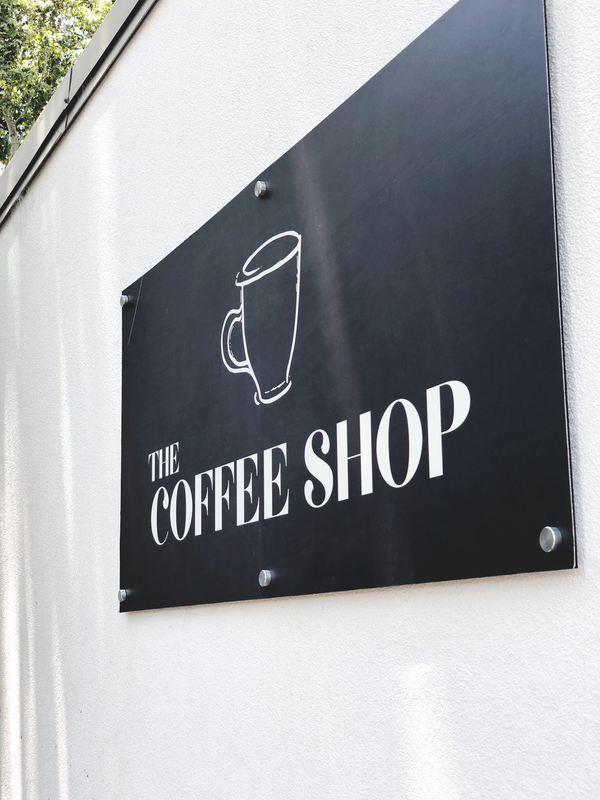 The Coffee Shop – We were so excited to not only find soy and almond milk as options, but also a plethora of vegan snacks! 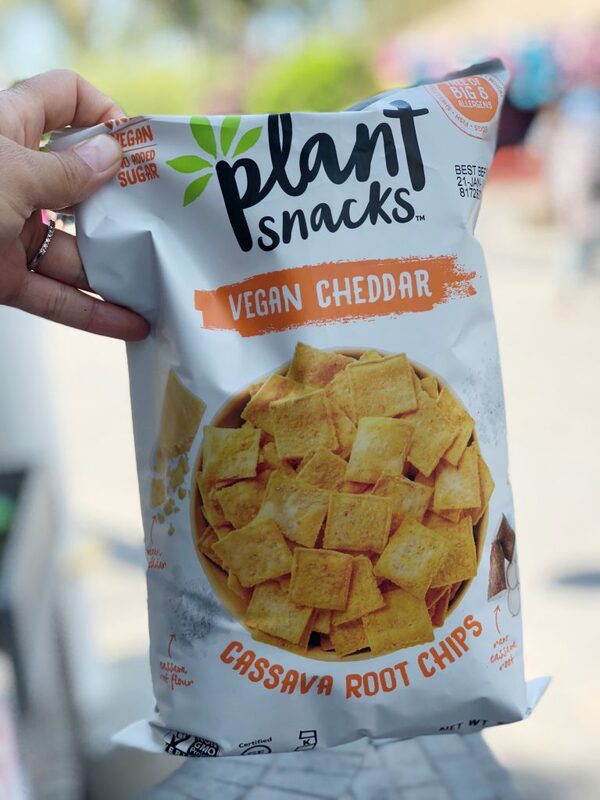 These Plant Snacks Chips were so good! 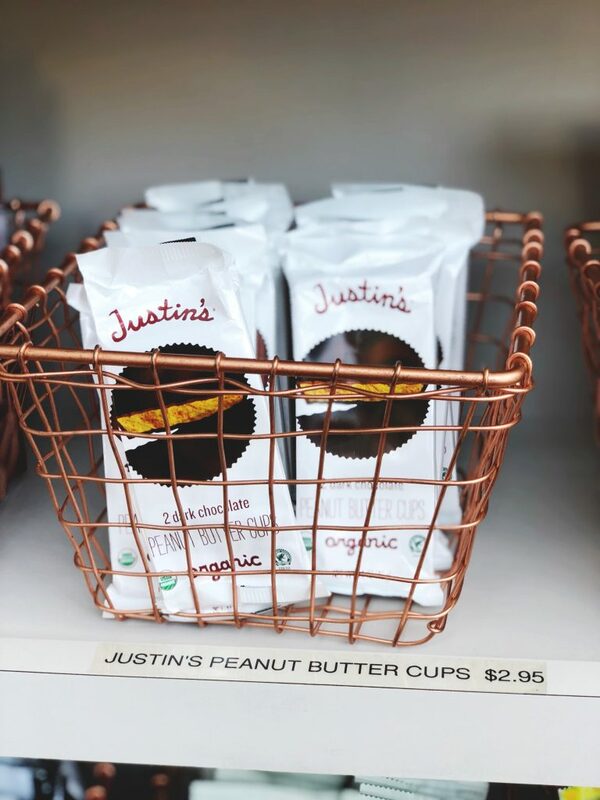 And you can never go wrong having Justin’s Peanut Butter Cups available. 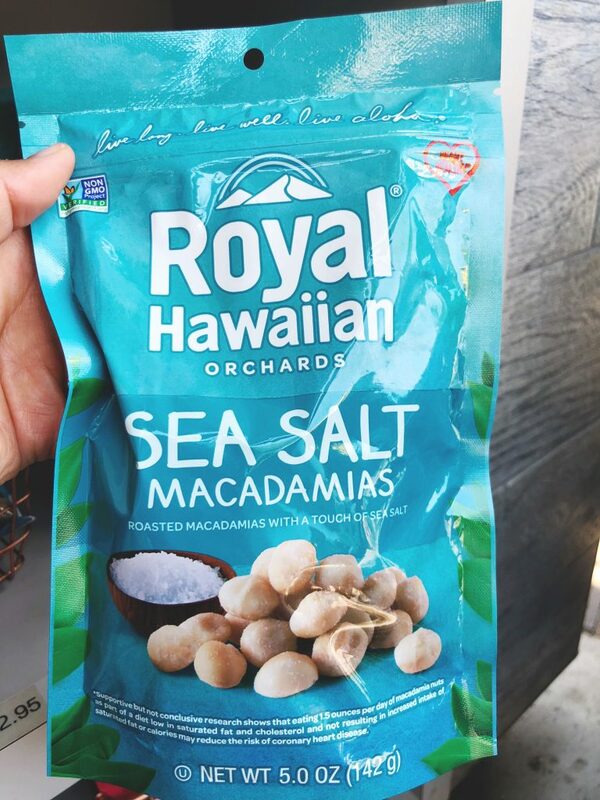 I craved these daily while pregnant with Cam. 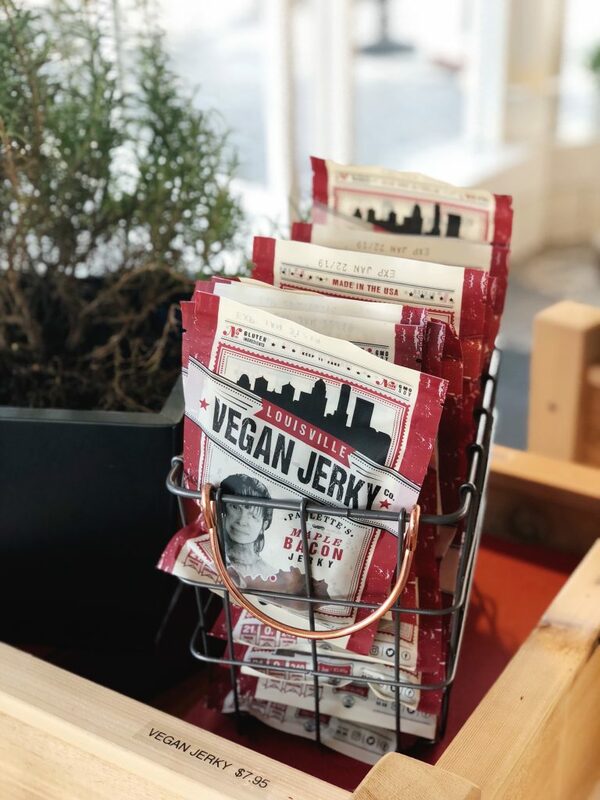 Our favorite vegan beef jerky! Whoever the buyer for snacks is at Legoland, they are doing something right. And at reasonable prices. 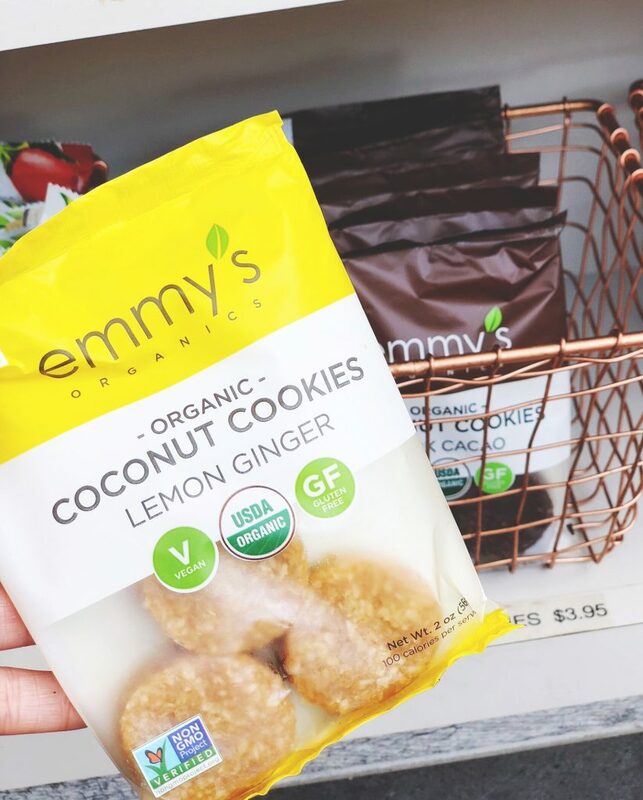 It feels so refreshing and progressive to have so many snacks with simple, clean ingredients available. We ate our way through the park as much as possible, but weren’t able to hit all of the vegan options. There is also a great salad bar and a pasta with marinara option. 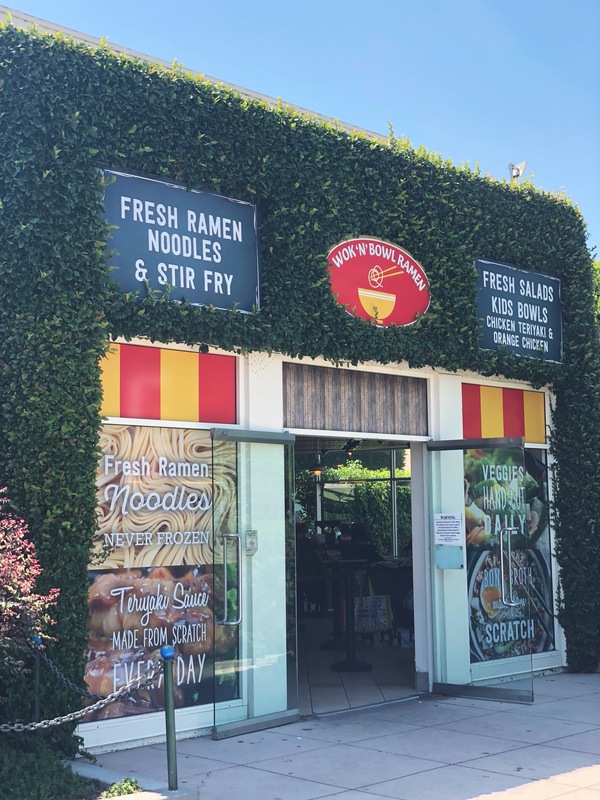 If you want to branch outside of the park, within a few minutes driving distance you can visit one of our favorite places – Plant Power Fast Food. Their burgers, milkshakes and selection of sauces will make you an instant fan. Another local option is Veggie Grill. With all of the delicious vegan food they offer, you can never go wrong with a meal there. 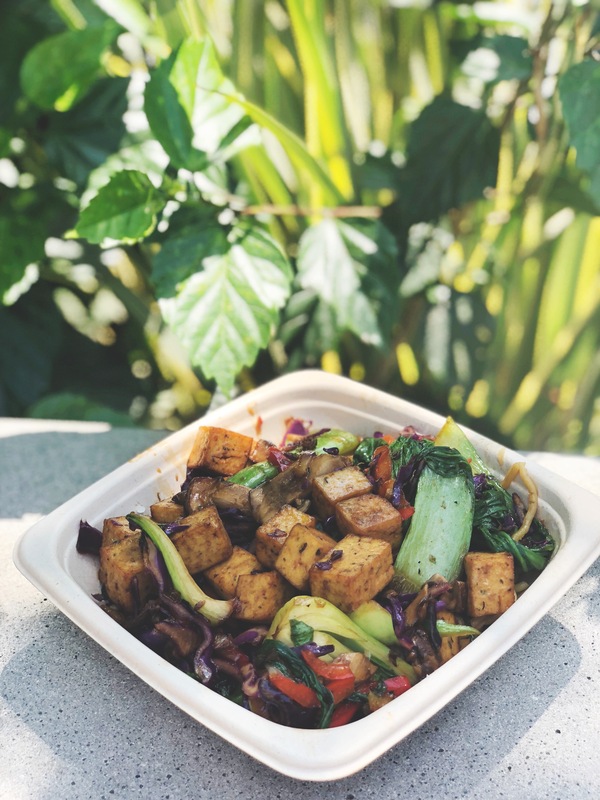 We visit Disneyland often and are always excited about their vegan offerings, so it was great to see what another theme park had to offer. 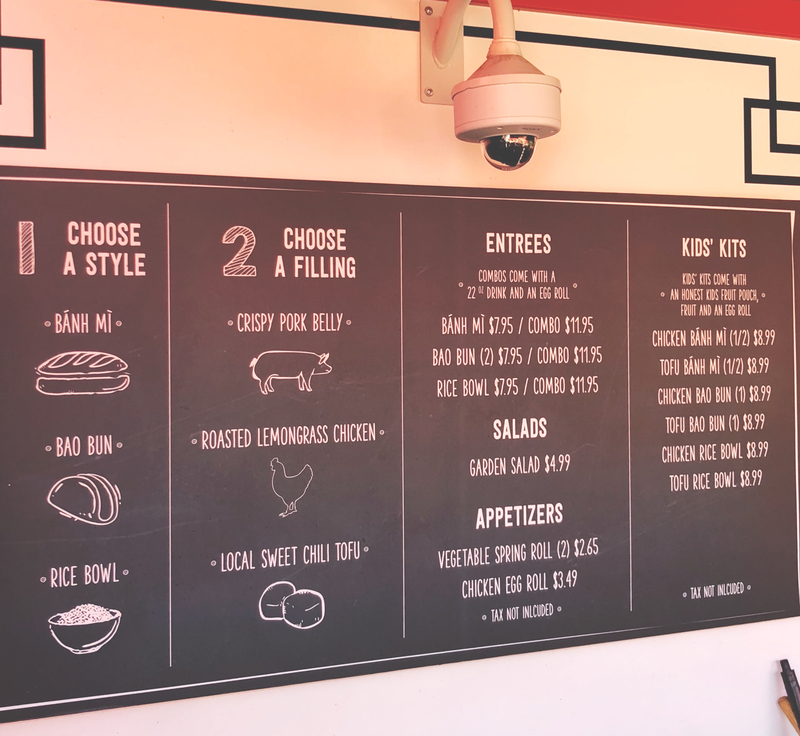 Disney definitely needs to take a cue from Legoland, listing all of their allergy information and vegan offerings on a printed menu that guests can keep. It’s such a welcomed addition and I applaud the park for being so open to different dietary restrictions. And here they are, one enjoying said snacks and the other crying because he can’t actually eat the snacks he found. For a vegan or allergy child, going to a place like this and being able to have an experience with different options is priceless. 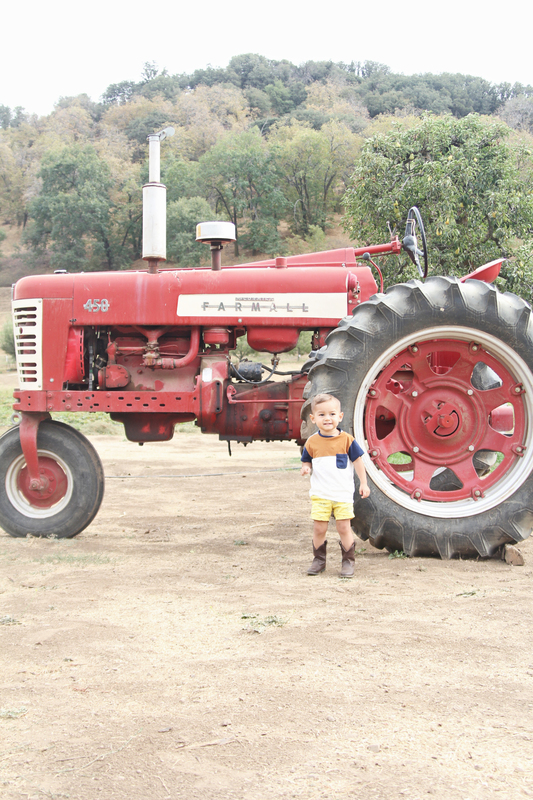 When visiting kid-friendly places, we are usually lucky to have one option and we’re always grateful for that. 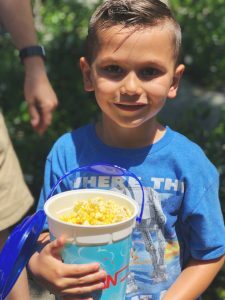 But at Legoland, our kids had the option to choose from different fruits, cookies, popcorn, popsicles, chips and vegan candy. And that to us, was priceless. 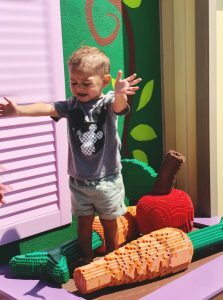 We would absolutely recommend Legoland as a great outing for vegan families and hope they continue to pave the way for plant-based food at amusement parks. *Keep in mind that we may receive affiliate commissions when you click our links and make purchases. However, this does not impact our honest reviews and opinions. 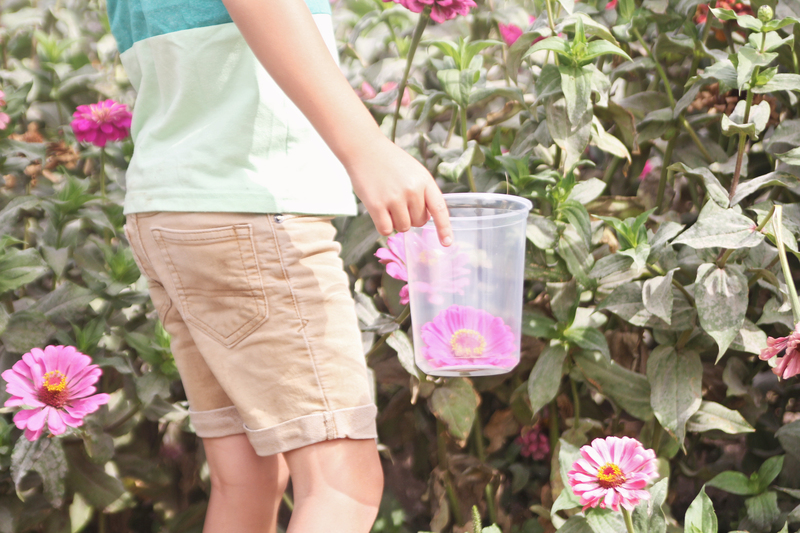 We try our best to share things that we genuinely love and hope that you do too! 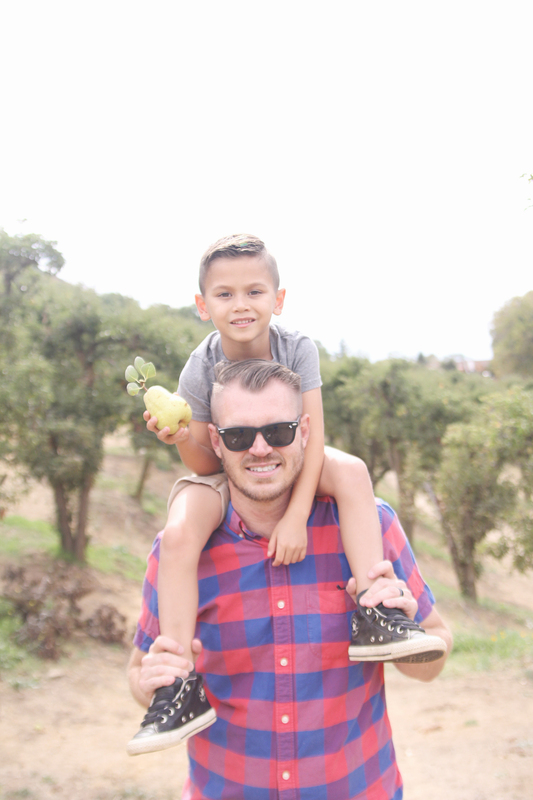 Today I’m sharing my family’s very favorite aioli we use for almost everything (hence, the name…my kiddos call it “everything sauce”). A funny story about this sauce: I once served it to a (non-vegan) friend and she loved it. About six months later I was talking to her husband about artichokes and he said “You should talk to my wife! She has an amazing dipping sauce for them.” It’s definitely flattering to hear feedback like that! 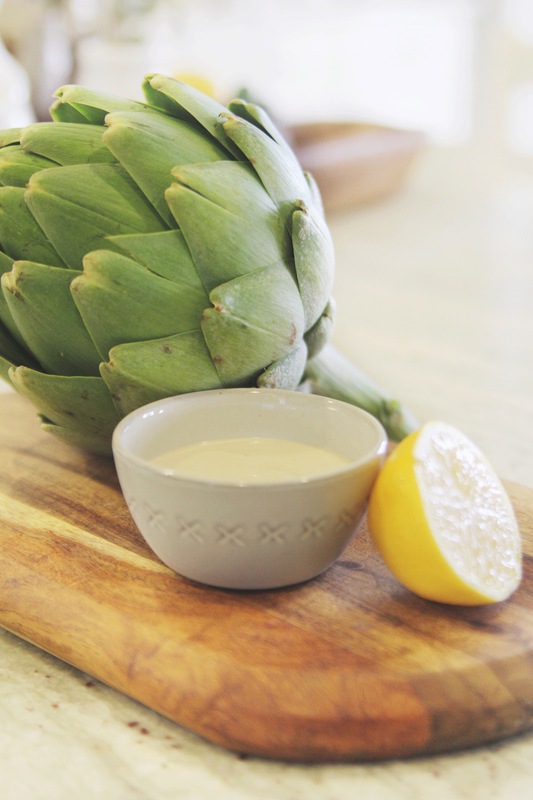 Our favorite use for this aioli is dipping steamed or roasted artichokes into it. It is seriously so good and one of my favorite meals! But other uses we have for it for are dipping our vegan oyster mushroom calamari in it or using it as a drizzle for vegan sushi. 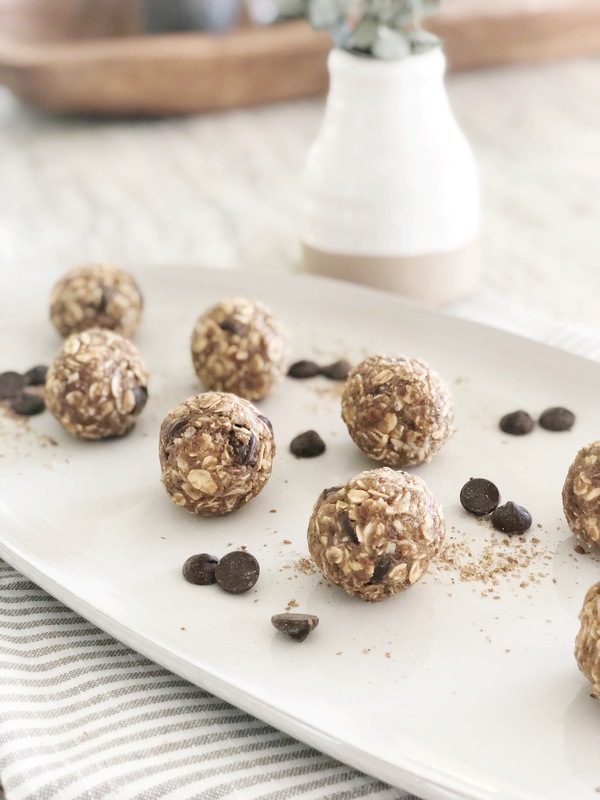 And the best part is: it only takes three ingredients and you probably already have them in your kitchen! This is the first “hand video” we’ve filmed, so go easy on us.😉 We have a few more coming up and have some others in production as well. We’re totally having a lot of fun with this though. Mix vegenaise, lemon juice and soy sauce in a bowl. If you would like a thicker consistency, add more vegenaise. Add additional soy sauce according to preference. Enjoy immediately or refrigerate (refrigeration will help thicken it up as well, but we eat it immediately). I need to preface this post with: this is not a health food. Vegan, yes. Health food, no. But it is delicious. It’s not something you would typically make everyday, but something that will definitely impress non-vegans. Second, there is a big misconception in vegan cooking and baking that you are required to make everything from scratch. I love cooking from scratch. I love making a cashew base for sweet and savory dishes. However, not everyone has the time, gumption or interest to do that. 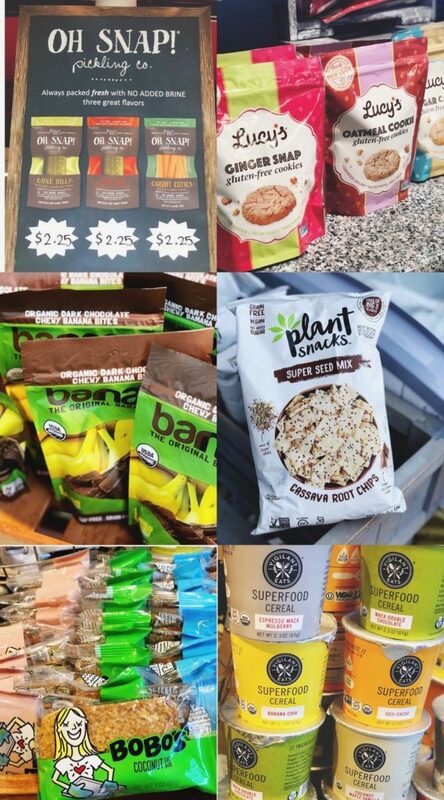 Veganism has come so far and we finally have amazing products available to us. Many traditional recipes call for store bought items and I don’t think that recipes that use them are any less delicious. They’re honestly more realistic in not scaring people away from cooking and baking vegan. I am a firm supporter of always keeping it real and keeping it easy (at least easy enough for my toddler to let me get through finishing whatever I’m cooking🤪). This is a dish that I have been incredibly excited to try and veganize. 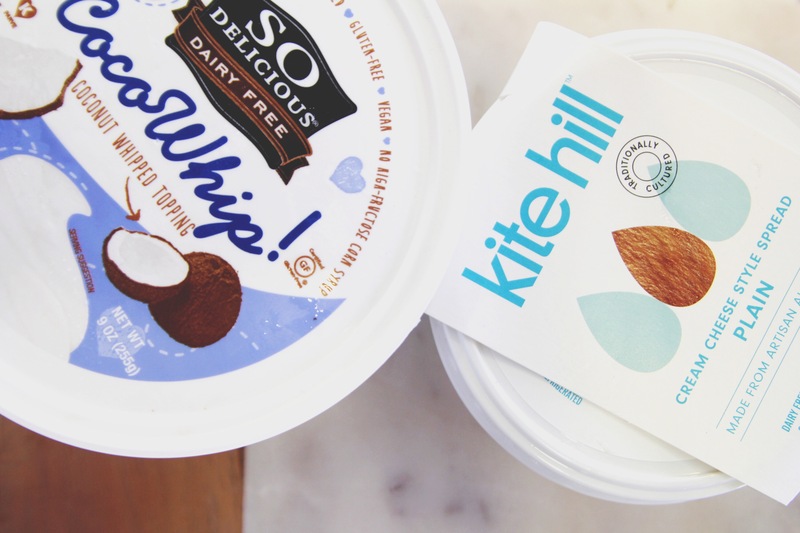 It is very similar to one of my childhood favorites (always made by my sweet Grandma Georgia-Maxine) but I have never had the confidence to make vegan…that is until Kite Hill released their amazing cream cheese. It literally tastes like traditional cream cheese (but without the cholesterol). 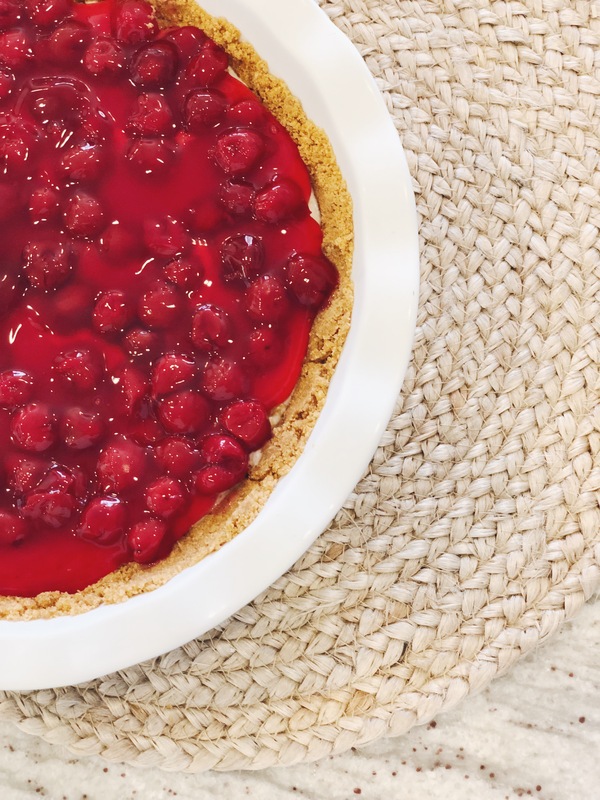 This sweet and tangy no-bake vegan cheesecake is an incredibly easy dessert to make. With a quick prep and a reputation as a total crowdpleaser, it’s the ideal dish to share at any event. 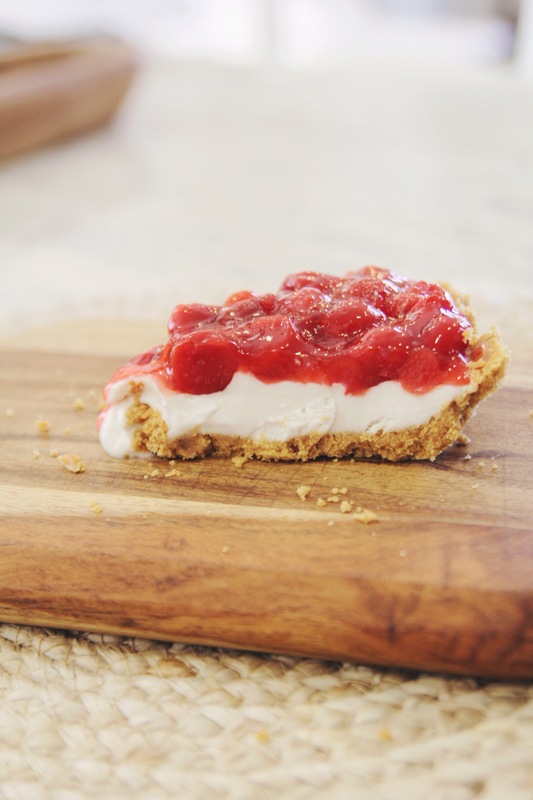 A sweet and tangy no-bake vegan cheesecake. Easy, quick and a total crowdpleaser. Blend graham crackers in blender until fine crumbs form. Pour into medium bowl, add melted butter and stir until well combined. Press mixture into pie pan. If you would like a firm crust, you can throw this in the freezer while you prepare the rest of the ingredients. Use an electric mixer on medium-high speed to whip the cream cheese and coco whip until blended. Do not overmix. Beat in lemon juice, vanilla and sugar, scraping the sides of the bowl as necessary. 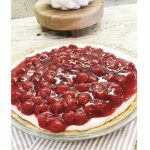 Once cheesecake is firm, add Comstock Cherries (or desired fruit) and serve immediately or refrigerate. I usually like to refrigerate another 20 minutes, so it's a nice, cold treat.